Because of my low mileage week, I hadn’t been very hungry. A small yogurt or English muffin in the morning was about all I could manage, which is pretty unusual for me. Back in the day I could throw down a giant cinnamon raisin bagel with peanut butter and banana and be ready for lunch two, three hours later. But last week, it was a half a salad for lunch. Maybe a cup of soup. At least it’s good to know my body still knows how to regulate when it’s not actively burning the same number of calories. But when I got home unexpectedly early on Thursday night, the desire to bake and, maybe, just maybe shove many cookies in my mouth was too strong. I’d been meaning to try a recipe from Cook’s Illustrated for a couple of months — I haven’t made a true peanut butter cookie, with flour, and with the cross hatches, in years. 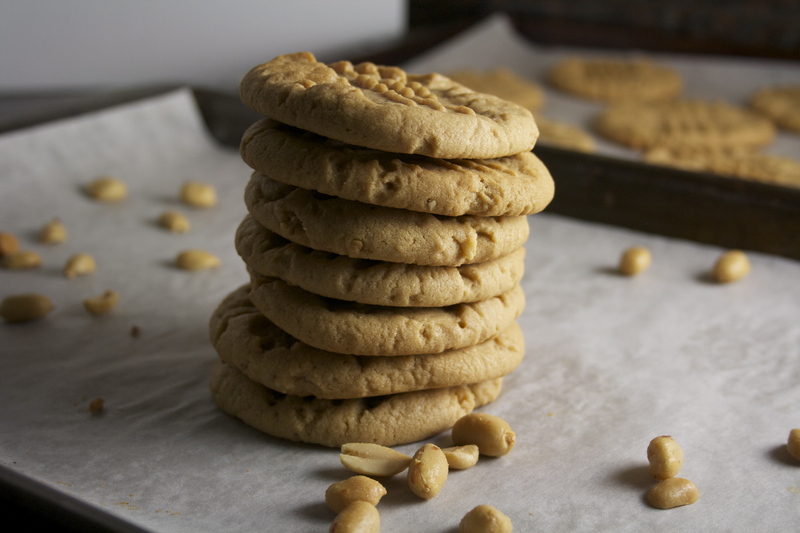 The base is buttery — both of the cream-based kind and the peanut kind. 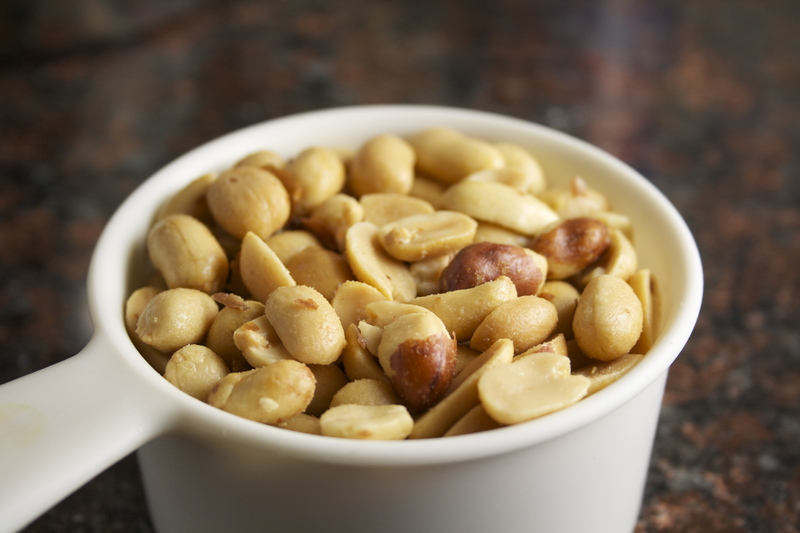 This recipe calls for extra crunchy peanut butter — or just plain crunchy, if that’s all you can find. I love the texture this style brings to the cookie, along with some freshly ground roasted salted peanuts that are folded in at the end. The cookies are taken out of the oven just shy of doneness, yielding a tender cookie that’s a little crisp and crumbly on the edges but still a little soft in the center. 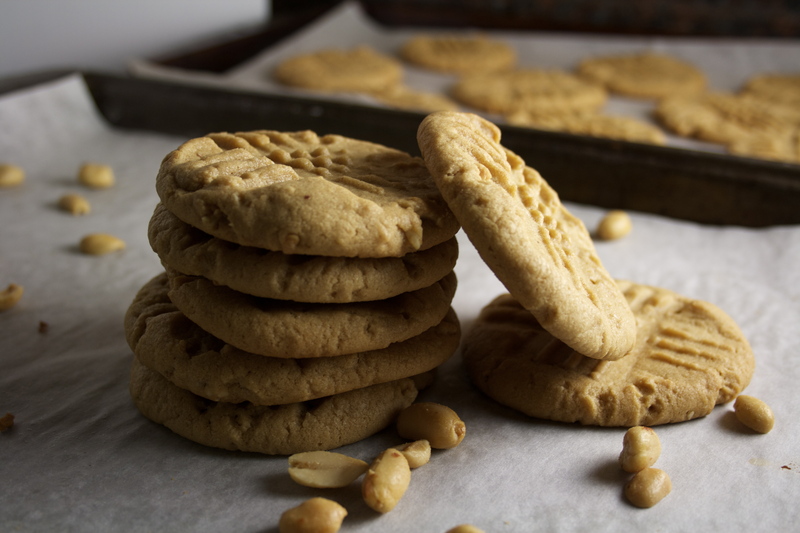 I think I still prefer the melt-in-your-mouth quality of the flourless peanut butter cookies, with their ultra pure peanut butter flavor, unmuddied by butter or vanilla, but these are excellent. They were the perfect post-race treat after 13.1 humid miles, a few of them caught in the rain. Hey, they say you should get protein and sugar back into your system not long after an endurance run. 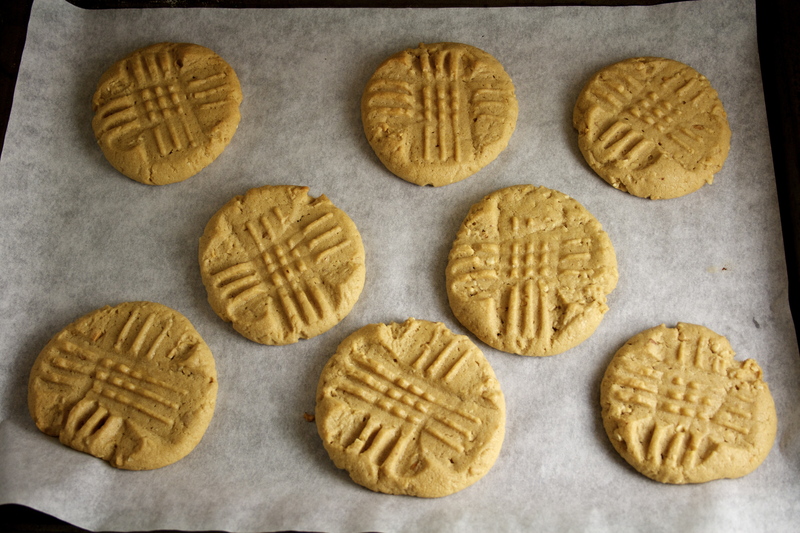 And who doesn’t love protein in the form of a cookie? Make sure you space these cookies far enough apart. The combined power of the baking soda and baking powder really does give them lift and breadth, and they grow quite a bit during baking. Another thing I maybe just might do next time: add chocolate chips. Because everything is better with chocolate. 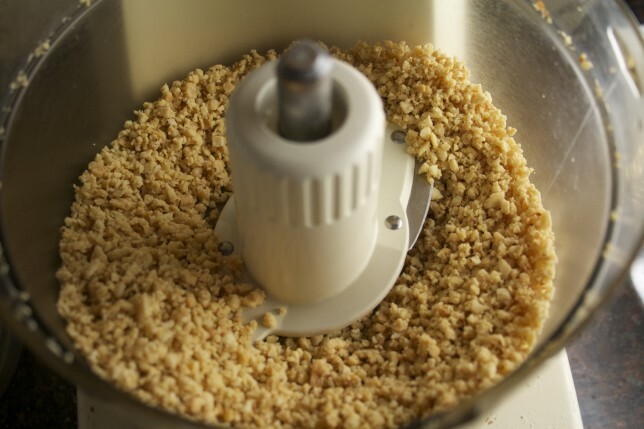 In a food processor, grind the peanuts until they are the consistency of breadcrumbs, about 14 pulses. Set aside. In a stand mixer fitted with a paddle attachment, combine butter, brown sugar, and granulated sugar and beat at medium speed until light and fluffy, about two minutes. Scrape down the bowl as needed. Add peanut butter and mix until fully incorporated, about 30 seconds. Add vanilla and eggs, one at a time, and mix until combined, another 30 seconds. Reduce the speed to low and add flour mixture, mixing until combined, 30 seconds. Mix in ground peanuts until just incorporated. Make sure there are no pockets of flour by giving the mixture a final stir with a spoon. 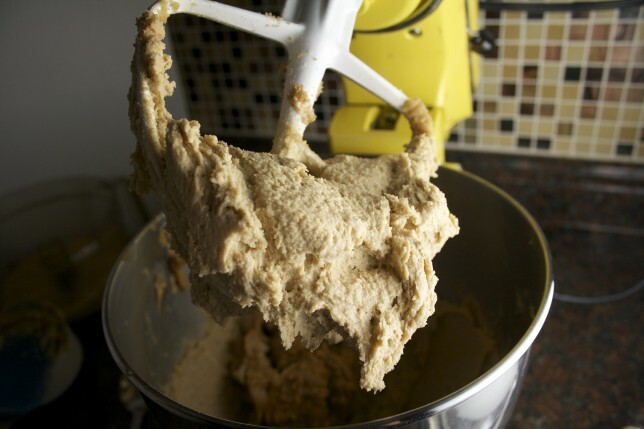 Working two tablespoons at a time, roll the dough into balls and place 2 inches apart on baking sheets. Use a dinner fork dipped in water and press into the dough at right angles to make the cross hatches. If using two baking sheets, place on the two oven racks and bake until puffy and slightly golden around the edges, about 10 to 12 minutes, switching and rotating the baking sheets halfway through. (If using one baking sheet, simply rotate the baking sheet halfway through.) The cookies will look slightly under-baked. 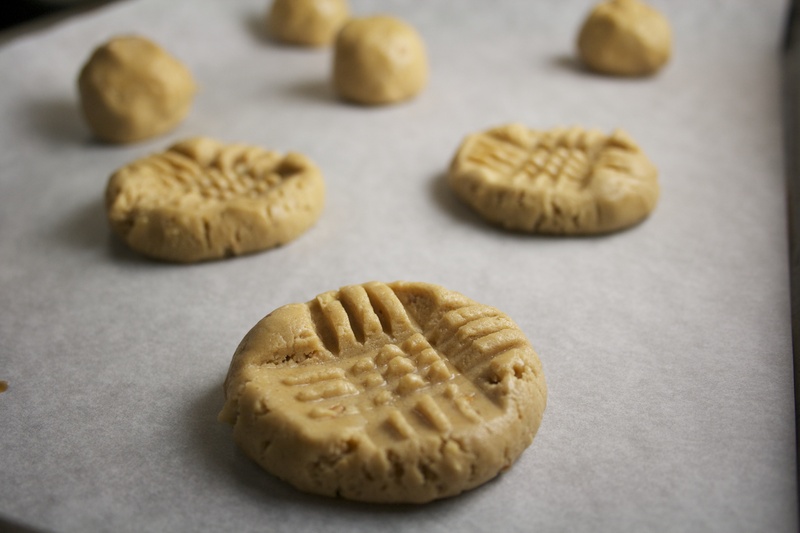 Let them cool on the baking sheets for about 5 minutes before transferring to a wire rack to cool completely.